Ever wondered about ringing up a psychic and asking her whether you are an Earth Angel? In her book Earth Angels, Doreen Virtue PhD, a metaphysical doctor of psychology who teaches around the world and is the author of Healing with the Angels, talks about the more spiritual amongst us. She has talked about the more spiritual amongst us on CNN, and her international workshops. 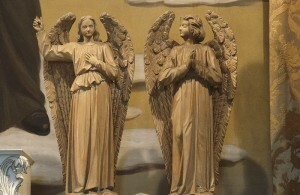 But to Doreen, the word spiritual has a particular ring to it and is to do with Angels, Earth Angels. So how can the more spiritual amongst us be Earth Angels? Well we can start by filling in the questionnaire in Doreen’s book “Earth Angels” to understand what “type” of angel slot we fit into. Doreen collates the answers to her unusual questions so that the more spiritual person suddenly discovers they are a) An earth Angel b) an Incarnated Elemental, c) a Star Person, or d) a Walk In. Okay try not to reach for the mineral water just yet. Doreen tells us some spiritual folk have angelic missions and have always felt very different to your average Joe Bloggs as if they had been dumped on planet earth without so much as “by your leave”. In fact Earth Angels often faced traumatic childhoods, difficulties integrating at school and were vulnerable to cruel jibes. They were not only spiritual from an early age, they were highly sensitive, super highly sensitive. Yet being spiritual might not necessarily make us an Earth Angel – Genghis Khan was probably spiritual in his own way too. Some well known earth angels were Mother Teresa, Florence Nightingale and even Audrey Hepburn, the type of souls who do not usually empathize with big shots, but get on with ordinary folks, no matter how famous, enlightened and brilliant they are! So let us list the aforementioned categories of Earth Angels, before you reach out for a gulp of creme de menthe. 1. The basic Earth Angel is physically tall, or large, usually curvy with a sweet face and wavy hair. They love helping down and outs, alcoholics, drug addicts and those who just “don’t get it! Earth Angels, of the basic order, emanate a huge aura, usually pink, of love. They work in hospitals, orphanages and leper colonies. 2. The incarnated elemental Earth Angel, looks like a fairy and is usually pixie faced and skips about the woods at moonlight. Animals, including cats and hamsters follow them with docile expressions. Children adore them. They love reading fairy stories. They float when they are in a hurry and have a very weird sense of humour. Audrey Hepburn was one, and Princess Di was another. 3. The Walk Ins are super enlightened souls who have taken over an ordinary person and transformed them into enlightened beings. That ordinary person could transmute from a bad tempered jerk into an epitome of saintly love. A Walk-In incident can occur after a traumatic experience like a car accident. A typical Walk In was Scrooge doing his bit in A Christmas Carol. He was walked-into by spirit guides, shaken around a bit, reprogrammed and then morphed into a loving, giving “diamond geezer”. 4 .Star People are genuine ET’s who have consciously decided to incarnate to help us lot out. They infiltrate all situations where loving kindness is called for. You will see them carrying an old lady’s bags, picking up a hurt child, cuddling a lost kitten. Handing out money to the down and outs, taking dirty people home and giving them baths, etc. Sounds like you? Well, you will know you incarnated from a planet if you look like David Bowie’s sister, for he is a Star Person. But seriously, these days being kind and spiritual means you could shock the nasty person who stabs others in the back, gossips, and is never straight about anything. They will turn green in your presence, run for the ladies or suddenly need a drink. If they start growing horns in your presence, you will know for sure that you are an Earth Angel! These are folks who do not even consider the word spiritual, except if it refers to Madonna. But we sense you are more than spiritual, you are an Earth Angel, in fact you even have a collection of angel books, statues and crystals in your home, and your large, sweet soft eyes pour out loving light even to the lady who grabbed your bargain in the January sales. You go beyond the veneer; you realize you are on al mission. You reach out. We seriously believe that there are far more angels incarnated on this planet than is actually known. Beyond the refined Mother Theresa’s of this world, there are ordinary folks who just emanate light and love because being spiritual to them is angelic. So start asking around, get some psychic feedback and find out if you are angel, because if you are we want a miracle now!